DTC Notification is out. DTC is recruiting for 100+(Not Specified) Bus Driver Post Posts. 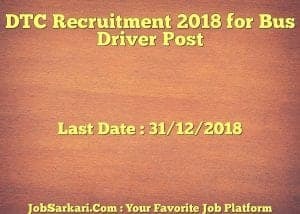 You can check DTC - Delhi Transport Corporation last date, download DTC notification, visit DTC official website and check other DTC Vacancy details.Complete Vacancy and recruitment Details about 100+(Not Specified) Bus Driver Post vacancies in DTC are provided below by JobSarkari.Com only for you. Last Date for Receipt of Application form 31/12/2018. 2.Candidate Need to Send the Hand Written Application to the Address Given Below. Delhi Transport Corporation , I.P. Estate, New Delhi On or before 31st December 2018. Q. What is the Last Date For DTC Bus Driver Post Vacancy ? A. 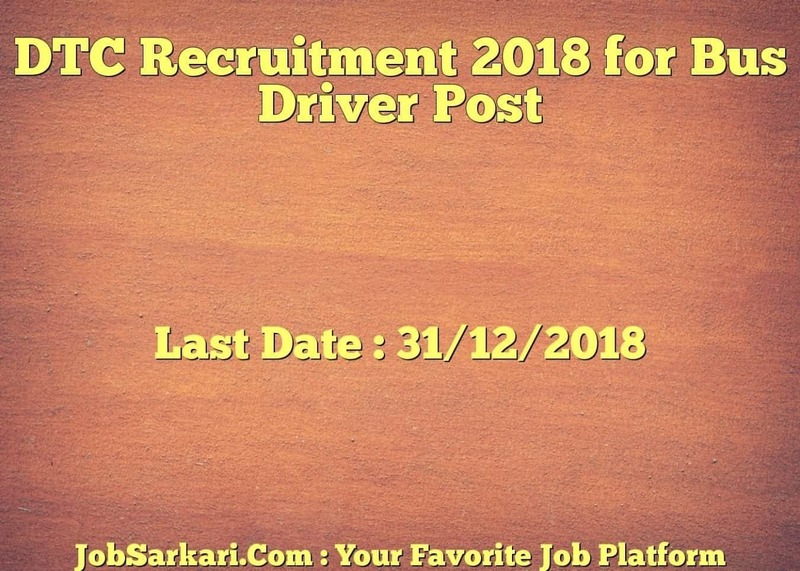 Last Date for DTC Bus Driver Post Posts is 31/12/2018. Q. What is the Form Type of DTC Bus Driver Post Recruitment ? A. The Form Type for DTC Bus Driver Post Posts is Offline. Q. How many vacancies are available in Delhi Transport Corporation Bus Driver Post Posts ? A. There are about 100+(Not Specified) Vacancies in Delhi Transport Corporation Bus Driver Post Posts. Q. What is the Full Form of DTC ? A. Full Form of DTC is Delhi Transport Corporation . So You Must Apply For This Job..
You Can Apply For Any Job As Given On POur Website…. Nahi Class 10th Pass Apply Kar Sakte Hain..